"The Book Bowl makes a sport of reading!" said Bill Derry, supervisor of library media services for public schools in New Haven, Connecticut. Find out how this competition sparks students to read more! Included: Tips for starting a Book Bowl in your community! "The Book Bowl makes a sport of reading!" said Bill Derry, supervisor of library media services for New Haven, Connecticut, public schools. "It is fun and challenging! It is exciting and educational!" More than 1,500 fourth and fifth graders in the New Haven public schools agree! They read nearly 5,000 books this year as participants in the city's annual Book Bowl, a contest that tests students' knowledge of ten selected books. They kids compete against other students at the same grade levels. The hoopla surrounding the Book Bowl is similar to the excitement of an athletic competition. Grouped in teams of five, students practice and prepare to battle their rivals. Each student strives to become an expert on at least two books from the ten selected for the contest. Parents and teachers coach the competitors. Instead of scoring with basketballs, the kids compete with what they learn from reading books. The challenge is about more than just reading lots of books. Kids learn the importance of understanding what they read. "We had to read really slow and keep track of all the words," said Jordan, a fourth grader who competed in the Book Bowl from Quinnipiac School in New Haven. "They had questions that were just itty-bitty stuff that happened in the story." Click here to read comments from some of the other kids who participated in the Book Bowl competition! Each team selects a captain, who becomes the spokesperson during the competition. Team members form collective answers to the questions. "It's cute," Derry said. "They hide behind the counter and they talk to each other in a huddle." To Shala, a fifth-grade student at Davis Street Interdistrict Magnet School, the best part of the contest was her team. "The most exciting thing about being in the Book Bowl was being on a team and working hard together," she said. "It gave me a chance to be with friends. It doesn't matter if you win or lose. It's all about fun!" START A BOOK BOWL IN YOUR SCHOOL! A committee selects ten books that are age appropriate for each grade division of the contest. You may want to start with only one age division initially, such as students in grades 6 through 8. You need to make sure copies of the books are available for all competing students. Develop questions for each book. Outside judges and library media specialists can develop the questions. Find two or three outside readers who will develop ten questions for each set of challenges. The library media specialists also develop ten questions. Questions should get more difficult as students progress through the three rounds of the competition, school finals, district play-offs, and district finals. Encourage the people who develop questions to focus on comprehension rather than factual recall. Have students practice with teammates. Each team of five students who practice developing questions and answers with teammates and a coach. Have students choose team captains. Each team selects a captain, who will serve as spokesperson for the group and answer the questions at the competition after consulting with team members. A local business might be recruited to help pay for books, trophies, and/or certificates. Local restaurants might donate food for the reception following the district finals, to make the celebration more meaningful. Televising the finals on local cable-access TV generates excitement. It also enables parents to watch from home. Students can watch the finals from their schools, and those not yet involved can learn about the Book Bowl. The winners from the school finals compete against other school finalists in the district play-offs. The four high scoring teams from the district play-offs then challenge one another in the district finals, held at the New Haven city hall. The local cable-access channel broadcasts the finals live. All participants receive certificates for the voluntary competition. All the district play-off participants receive medals, and all district finalists go home with trophies. A large trophy for the grand prize travels to the winning school each year. The Book Bowl got its start in 1995. Gail Hall, a library media specialist at West Hills Middle School in New Haven, borrowed the idea from the Battle of the Books competition held in a nearby community. The contest isn't new, she says. She speculates that it originated during the 1940s as a radio show contest. "The Book Bowl really has become a hallmark of the New Haven public schools' reading program because kids do it voluntarily," Hall said. "It is a collaboration opportunity to reach out to the schools, to reach out to each other and to the community. It epitomizes the Library Power concept!" The National Library Power Program promotes the creation of new public elementary school and middle school library programs that improve the quality of services for children. In 1994, New Haven became one of 19 Library Power school districts in the nation. As part of the national program, the New Haven Public Education Fund received $1.2 million in a three-year grant from DeWitt Wallace-Reader's Digest Foundation. The foundation has poured $40 million in grants into the 19 Library Power districts. The Book Bowl is one aspect of Library Power and New Haven's eight-year plan, 2001: A Library Media Odyssey, to revitalize its library media services. Dr. Reginald Mayo, New Haven superintendent of schools, initiated the plan in 1993. The primary purpose of the Library Media Odyssey is to put a library media center in every school and to staff it with a full-time, certified library media specialist, Derry said. When the program began seven years ago, New Haven had 12 library media specialists. Today, there are 39. Next year, the plans call for putting a specialist in each of the city's 46 schools, Derry said. Other goals include increasing the number of volumes in book and reference collections, integrating the library into the school curriculum, promoting parental and community involvement, and supplementing and enriching classroom involvement. Library Power agreed to donate up to $10 per pupil for library allocation if the city matched it, Derry said. In 1993, per pupil allocation was $2.20. With the Library Power donation and the city's matching funds, the allocation increased to $20 per pupil in 1997. "Dr. Reginald Mayo was the key here," Derry said. "He agreed to [increase] the allocation per pupil." Other sources helped fund New Haven's efforts to improve library media services. The New Haven Public Education Fund, the Community Foundation of Greater New Haven, and the Carolyn Foundation also contributed. The University of Wisconsin in Madison is conducting research that is evaluating the impact of the National Library Power Program. Preliminary findings indicate libraries can be transformed from a passive and supplemental role to a central teaching and learning capacity. Fleet Bank also supports the Book Bowl. The bank provides funds and a site for the Book Bowl reception. A vice-president of the bank, Jeff Klaus, hosts the finals. The bank's contribution has helped the city purchase trophies and books. New Haven schools continue to improve their library media services. "The state said we can't continue to have outdated materials in these schools," Derry said. Two years ago, when the three-year grant from the DeWitt Wallace-Reader's Digest Foundation ran out, the state of Connecticut kicked in another $1.2 million to buy books for elementary school library media centers. The American Library Association site offers information about a variety of issues that pertain to library and media services. This site offers news and information, including Professional Resources, and Internet Resources for school library media specialists. It also offers a link to its journal, School Library Media Research. 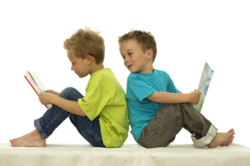 Book Adventure: An Online Reading Program Rewards Young Bookworms!